Be The 1st Collector To Send In “GRIFFIN” To Get Special “III” Autograph Patches. Expect a buyers premium to be in place on these cards until the promo is over. Some of the best combo’s the NFL has seen. 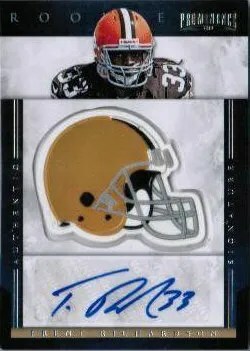 Panini didn’t release too much info about this set pre-release. Only one blog post before posting info this on this site. 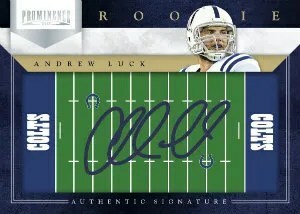 The field plate autograph cards remind me of cards found in 2010 Panini Epix, which didn’t return in 2011. 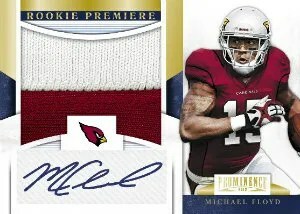 I’ve seen Panini use the Field Plates in promotions – and they return in Prominence. You’ll also find manufactured team logo autograph cards – which are basically the same as the cards found in Rookies & Stars sets in the past … making this kind of a mix/match set that collectors might enjoy the variety of top rookie hits.